This year marks the 400 th anniversary of the birth of one of the most celebrated painters of the Spanish Golden Age, Bartolomé Esteban Murillo (1617– 1682). A number of international exhibitions are planned to pay tribute to the artist’s achievements, the first of which will be presented this fall and winter at The Frick Collection. Murillo: The Self -Portraits is also the onl y such commemoration occurring in the United States. The exhibition opens in New York on November 1, 2017, and continues through February 4, 2018, after which it moves to London’s National Gallery from February 28 through May 21, 2018. Murillo’s career w as a successful one, and he painted canvases for the most important patrons and churches in Seville. While the majority of his artistic production was for religious institutions, he also created allegorical and genre scenes. Murillo’s paintings of urchins in the streets of Seville are particularly well known and, together with his Immaculates and other religious images, they remain the artist’s signature works. Less familiar are a number of portraits, both full - and half -length, that Murillo painted of his patrons and friends. Biographers and scholars have paid little attention to this aspect of the artist’s career, and this is the first exhibition dedicated exclusively to the subject. the exhibition. Significantly, the painter’s only known self -portraits will be shown together for the first time since they were documented in the 1709 inventory of his son Gaspar’s art collection. These two self-portraits —one recently given to The Frick Collection and the other from the National Gallery in London—will be shown with a group of other works by Murillo that will provide a larger context for these rare canvases. At the Frick, seventeen works, paintings as well as works on paper, will be presented in the intimate lower -level galleries. Murillo: The Self - Portraits is jointly organized by Xavier F. Salomon, Peter Jay Sharp Chief Curator, The Frick Collection, and Letizia Treves, Curator of Later Italian, Spanish, and French 17th- Century Paintings, National Gallery, London. The earlier of the two self -portraits featured in the exhibition, was acquired in 1904 by Henry Clay Frick and remained in the Frick family until 2014, when Trustee Mrs. Henry Clay Frick II generously gave it to the museum. (The self -portrait was the first Spanish painting acquired by Mr. Frick, who subsequently purchased several well -known masterpieces by El Greco, Velázquez and Goya.) The portrait was sensitively restored by Dorothy Mahon at The Metropolitan Museum of Art and a seventeenth -century Spanish frame was provided by Colnaghi. The painting is among Murillo’s earliest known works and dates from the first half of the 1650s, when the artist was in his mid -thirties. It was probably intended for his own collection, as is suggested by its later documentation in his son’s collection. 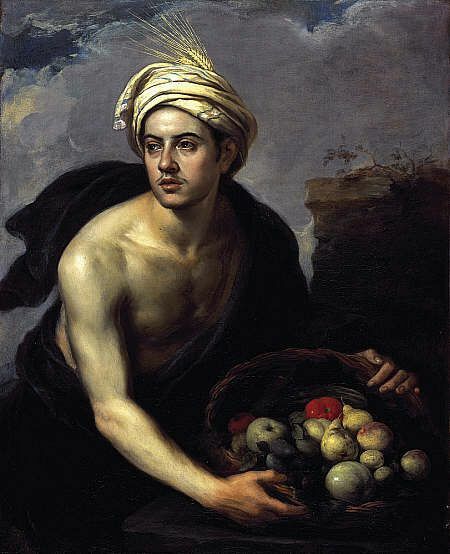 Murillo presents himself in a black jacket typical of the Spanish upper class. His sleeves are slashed and reveal his white shirt underneath, and he wears a rigid white collar, known in Spanish as a golilla. The painter’s hair is long, over his shoulders, and he sports a fashionable moustache and slender goatee. No attributes or objects identify him as an artist; however, a long inscription in red letters declares him a famous p ainter. Because the inscription incorrectly gives his birth date as 1618 (instead of 1617) and states his death date, we know that it was added posthumously. Murillo’s face is surrounded by a trompe l’oeil stone frame, a hollowed- out block, chipped and eroded by time. The block, in turn, is propped on top of a stone ledge. This fictive frame is unique in concept and is not found in any other work by the painter or by his followers. 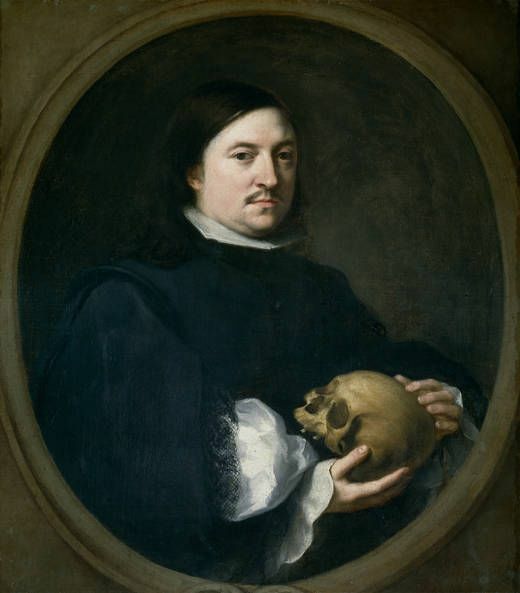 Within a few years of his wife’s death, in 1663, Murillo executed a second self - portrait, which he dedicated to his four teenage children. 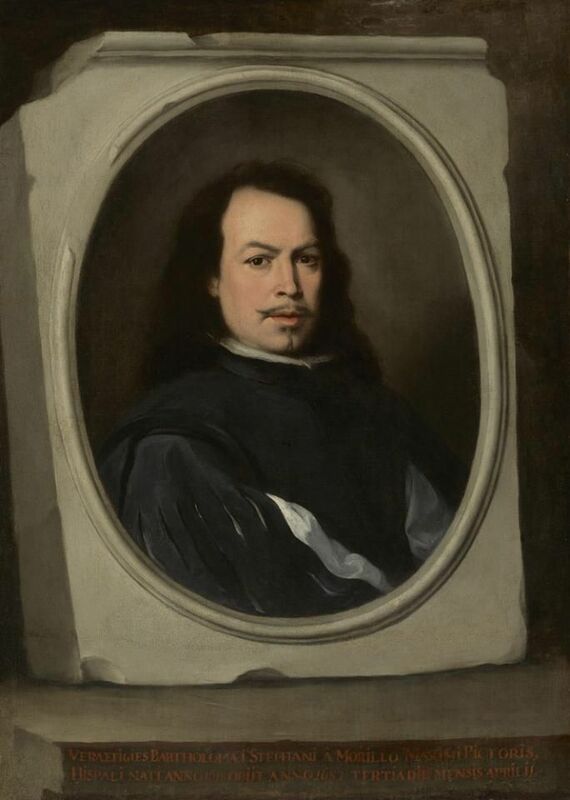 The elegantly rendered Latin inscription below the portrait trans lates “Bartolomé Murillo painted himself to fulfill the wishes and prayers of his children.” In format, this self -portrait is similar to the earlier one. Murillo appears again in three- quarters pose, gazing out toward the viewer. He looks older, his expression forlorn and weary. By this date, Murillo was in his fifties and had lost not only his wife, but also five of his nine children. The outfit he wears is similar to the one in the Frick self -portrait: a black jacket over a white shirt. The golilla, however, has been updated with a more fashionable style: a wider, unstarched collar decorated with lace, known in Spain as a valona (Walloon collar). The trompe l’oeil stone frame around Murillo’s image is more elaborate than the one in the earlier self -portrait. Decorated with scrolls and idealized foliage, it is resting on a stone ledge, set into the niche of a wall. Flanking the frame are the signature attributes of an artist: to the left, a wooden ruler, a sheet of paper with a red- chalk drawing of human leg s, a compass, and a chalk holder; to the right are the painter’s brushes and palette. While the sitter in the earlier self -portrait could be mistaken for a nobleman (were it not for the posthumous inscription), the later self -portrait clearly depicts an artist, who names himself in the inscription carved into a cartouche below the frame. Soon after Murillo’s death, in 1682, his second self -portrait was engraved in Flanders, probably to commemorate his life and career. This was the first of many portraits of Murillo to be produced in print form, and it disseminated the painter’s image across Europe. The engraving is signed by its author, Richard Collin, who had worked in Rome and Antwerp before moving to Brussels, in 1678, to work as a royal engraver for Charles II of Spain, who then ruled Flanders. Below the portrait, a plaque is inscribed identifying Murillo and replicating the dedication to his children found on the original canvas. The inscription further explains that the engraving was commissioned by Nicolás Omazur, an Antwerp merchant based in Seville, who had been a patron of Murillo’s. As is typical of engravings after an original, the print reproduces the self -portrait in reverse. Collin did not copy the painting exactly, however. Most conspicuous is the fact that, in the engraving, Murillo’s hand no longer gras ps the frame. In addition, the oval frame in the engraving is narrower and higher than the one in the painting, the painter’s attributes have been omitted from the ledge, and the inscription is now presented on a tablet rather than a cartouche. With these modifications, the print evokes the tombs and monuments found in European churches, in which carved busts were placed in niches over inscriptions commemorating the life of the deceased. The composition of many of Murillo’s portraits were related to print culture in Spain and responds to the format used in that art form. His earliest known portrait, dated 1650, now in the collection of the Duchess of Cardona, was restored for the exhibition and is on view to the public for the first time. 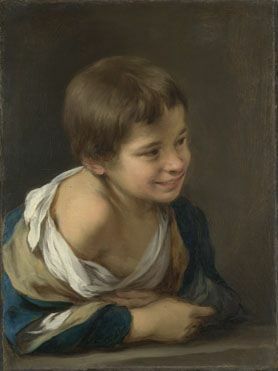 It represents Juan Arias de Saavedra, a Sevillian aristocrat, and was painted when the sitter was twenty -nine years old (only four years younger than Murillo). The portrait’s inscription provides most of the information we have about Saavedra and his friendship with Murillo. Murillo’s two self -portraits and many of his portraits present the sitters as if “set in stone.” The stone block of the Frick self -portrait, chipped and scarred by time, and the frames of the London self -portrait and of Saavedra’s portrait are striking elements in these compositions. Stones and ruins occupy the background of many of the artist’s works. Murillo’s interest in remnants of antiquity is not surprising. Seville was known in the seventeenth century as the “New Rome.” Built on the ruins of the Roman city of Hispalis, it was the only major center in Spain to boast ancient foundations. A few miles northwest of Seville are the ruins of Italica, one of the largest and most important cities of the Roman empire and the birthplace of the emperors Trajan and Hadrian. Throughout Seville, relics of its ancient past would have been visible and known to Murillo. Many aristocrats in Seville collected antiquities and ancient coins (including Murillo), and these also may have inspired him. One of the extraordinary features of the London self -portrait is the painter’s right hand protruding out of the frame, into the viewers’ space, clutching the frame itself. The origin of this trompe l’oeil effect is probably derived from contemporary Northern prints, which were readily available in Spain during Murillo’s time. The protruding hand dissolves the boundaries between art and reality, bringing the sitter closer to the viewer. It is as if Murillo tries to break down notions of time and space, making his presence felt beyond his death. Perhaps the most beautiful of Murillo’s paintings to use trompe l’oeil to explore the relationship of art and reality is Two Women at a Window . Painted in the late 1650s, it remains one of the best known and most mysterious of Murillo’s works. Although technically a genre scene rather than a portrait, the painting shares common features with the other works in the exhibition. The nature of the painting’s commission and its message remains unknown, but the canvas is designed, like Murillo’s London self -portrait, to confound the viewer with an illusion of reality beyond the painted space. Both of Murillo’s self -portraits are potent statements about his art, fitting tributes with which to commemorate his life and work on the four hundredth anniversary of his birth. Accompanying the exhibition is a richly illustratedpublication that investigates the two self -portraits side by side, highlighting similarities and differences, and placing them in the context of the broader group of works in the show. In addition, the book discusses recent technical analysis, offering a better understanding of how the self -portraits were painted and providing a rare opportunity to compare how one of the most celebrated and influential European painters chose to represent himself at different stages of his life and career. The book’s lead authors are exhibition curators Xavier F. Salomon and Letizia Treves, while the technical studies are written by María Álvarez -Garcillán, Silvia A. Centeno, Jaime García- Máiquez, Larry Keith, Dorothy Mahan, and Nicole Ryder.